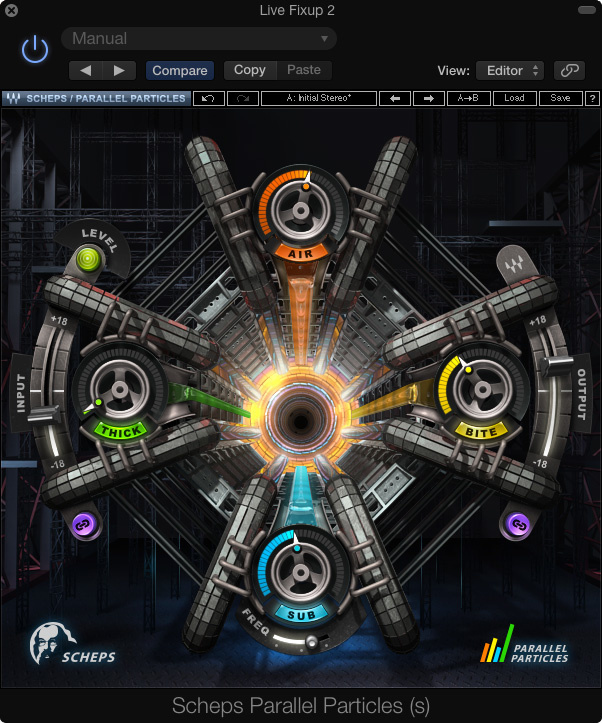 The new Waves Scheps Parallel Particles plug-in is probably the closest you’ll get to a ‘more of everything’ processor. It was developed in collaboration with top mixing engineer Andrew Scheps, who has worked with artists as diverse as Adele, the Red Hot Chili Peppers and Metallica, and is based on some of his personal processing recipes. In essence, Parallel Particles is, as its name suggests, a parallel processor, and it is designed to provide independent control over enhancement in four key areas of the sound spectrum. However, there’s more to it than straightforward multiband parallel compression. The GUI looks like an aerial view of a Death Star elevator shaft, yet sports relatively few controls. Setting the input level is achieved using a fader and a three-colour LED: the aim is to have this showing yellow most of the time. A link button allows the output to be adjusted in tandem with the input to maintain a constant level when tweaking, if required. As usual for this type of Waves ‘easy drive’ processor, each control adjusts multiple parameters that the operator doesn’t need to know about — operation is designed to be very intuitive. Andrew Scheps says the plug-in was designed to allow the user to directly control attitude, energy and emotion without needing to be an expert audio engineer, and I think that’s as good a description as any. Other than setting the bass filter frequency, adjustment is simply a matter of dialing in the desired amount of enhancement in the four frequency regions by ear. Individual sections can be bypassed if not in use. Both the Sub and Air controls are linked to harmonic generators, where the processing includes the synthesis of resonances not present in the source material. The operating range of the Sub control can be set anywhere from below 32Hz to below 80Hz. Air does much as its name suggests, lifting out high-end detail in a smooth but positive way, rather like a polite enhancer. Thick addresses the lower mid-range, adding warmth and weight, but seemingly without boxiness, while Bite adds aggression to sounds such as snare drums and electric guitar that occupy the upper mid-range. The in-built attack and release characteristics of the Bite processing section contribute to its impact. While the plug-in can be used to enhance a complete mix, it really comes into its own when mixing, where multiple instances can be adjusted to meet the needs of individual tracks or submixes. It works on just about anything, adding air and attitude to vocals, weight to basses, snap to drums and fullness to anything that’s sounding a touch on the thin side. Operationally it’s not that far removed from how you might work with an EQ, so the controls feel instantly familiar, but the results go far beyond what can be achieved using EQ alone. Because this plug-in relies on parallel processing, the dynamics of the original signal are not overwhelmed, so transients stay sharp, yet everything can be made to sound much bigger or more forward without increasing the peak level too much. Despite its ability to add weight, air and aggression, Parallel Particles sounds a lot smoother and less fatiguing than most of the ‘make it bigger’ processors I’ve tried, and it seems to work just as well on subtle material as it does on heavy rock. Achieving similar results using conventional plug-ins would probably be quite challenging, requiring considerable engineering experience, so distilling this level of processing down to little more than four knobs is pretty impressive.